The first Jazz music festival on Tinos was organized by and held at the Cultural Foundation of Tinos in 2009, as the “Tinos Jazz Festival”. Thanks to the efforts of the staff, musicians, volunteers and friends of jazz and of course the personal input of the festival’s artistic director George Kontrafouris and his associates, the festival quickly established itself as a major event in the Aegean. The festival - in its 8th year now - was renamed “Jazz on Tinos” in 2014. Part of its success is due to the fact that it gave the initially limited – yet growing - audience a harbour to enjoy jazz at its best. The festival also gives Greek and international musicians an opportunity to meet and work together. The festival is dedicated to a different theme each year. The event was launched in 2009 with Finland as an honoured guest country. In 2010, the stage welcomed a large number of both accomplished and less well known, but talented and promising, Greek musicians. In 2011, the festival was dedicated to Women in jazz. In the two following years, the focus was to gather experienced performers and young promising jazz musicians. Since 2014, the idea has been to promote artists with recent releases as well as gifted young musicians. The festival is a free entrance event in accordance with the Cultural Foundation’s public benefit purpose, i.e. among others: to contribute to culture and society and to introduce contemporary music and artistic movements to the island. 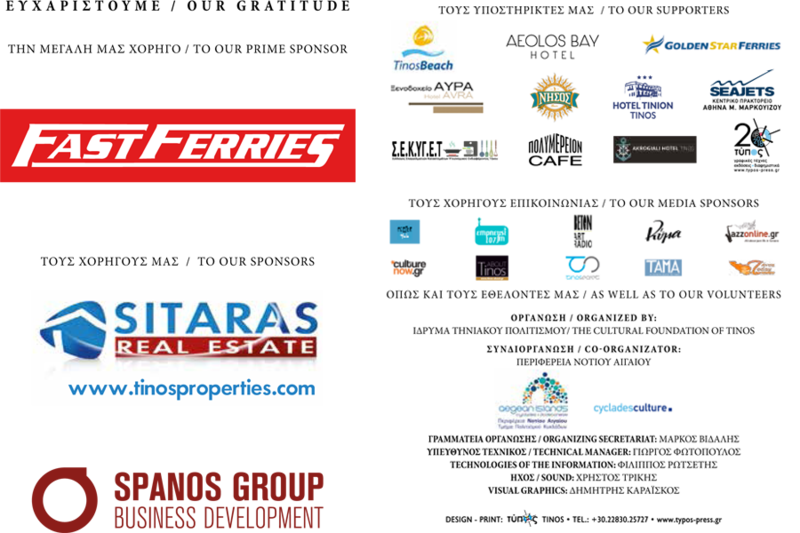 The festival is primarily funded by the Cultural Foundation of Tinos, as well as by donations and services by public or private entities, embassies and international foundations with a cultural or an artistic purpose. Since 2015, the Jazz on Tinos festival is co-organized by the South Aegean Region.